On June 30, 2012, we received an emergency call from the City of Everett. On a street undergoing roadway reconstruction, a trash truck backed over a plate that was covering the excavation shown in the picture and broke the nut, stem and portion of the bonnet on this turn of the century (and I don’t mean this century), 16-inch double disc leaded in gate valve. There was no shutdown on this street and the twin to this valve was at the other end of the street, just as shallow. J. Marchese & Sons was performing the roadway reconstruction work and excavated the size holes we need. SSPLS came in on Saturday, and mounted the sleeves, temporary knife gate valves and dry ran the completion plugs. The concrete encasements were poured that day. On Monday, July 3, we had both taps done and linestops in by 10 AM. 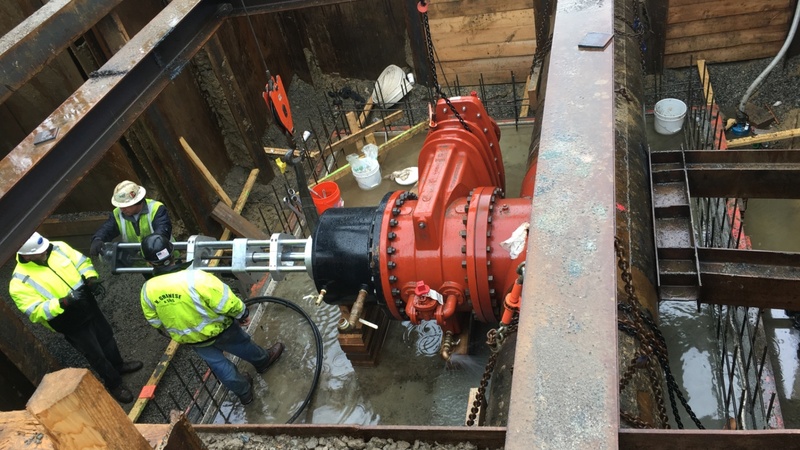 Because of the limited laying length space, we had decided beforehand to install friction clamps and threaded rod behind the fittings so that the pipe could be cut in the same excavation and new valves could be installed in the same spot as the old valves that were cut out. By 6 PM that night, the two old valves had been replaced by two new ones, and the linestops had been retracted and the completion plugs had been installed. Everyone, including the residents of the street, was able to enjoy their July 4th, WITH WATER!!! !